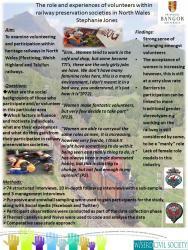 25 year-old Stephanie, from Caernarfon, submitted her poster about women and the railways at the ‘Gender in Wales Then and Now’ symposium, which was held at Swansea University on 7th June 2017. Held in conjunction with the University of Wales Press and the Higher Education Funding Council for Wales, the conference brought together a range of interdisciplinary Welsh academics and early carer scholars to share ideas, theories and understandings of gender in Wales. Stephanie’s poster was based on the findings from her PhD research, which examines volunteers on Welsh heritage railways. Her prize was a textbook edited by Michael R Ward, entitled "Gender identity and research relationships: Studies in qualitative methodology, volume 14"
Stephanie’s PhD in Sociology and Social Policy is funded by WISERD.